This French-inspired recipe is loose and forgiving in proportion and spirit. Add more peas if you like, or less. You might spruce it up with a dollop of creme fraiche just before serving or add a splash of white wine instead of stock while cooking. A small handful of chopped herbs such as chives, basil or mint would be nice as well. 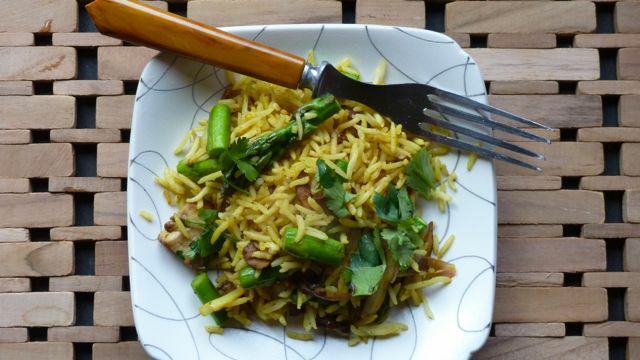 Button mushrooms and asparagus are sautéed with cumin seeds and onion creating the flavor base for this Indian-inspired rice dish. Garam masala lends a hint of warming spice. This dish is a perfect use for leftover rice, and you can substitute 2 1/2 to 3 cups cooked rice for the uncooked grains. Make sure the rice has cooled fully before stir-frying with the vegetables or the mixture may become gummy. Garam masala is an Indian spice blend that includes cumin, cinnamon, cloves and cardamom, among others. You’ll find it at most grocery stores. 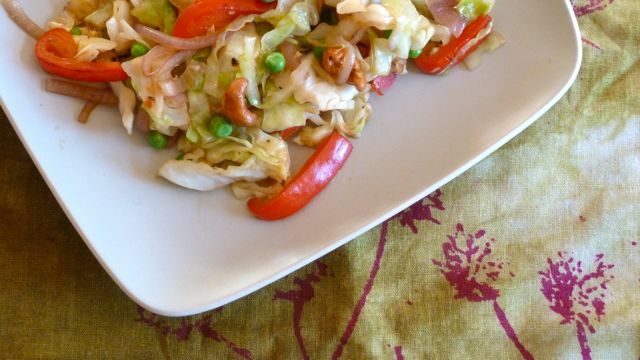 This easy stir-fry works with any sort of cabbage. 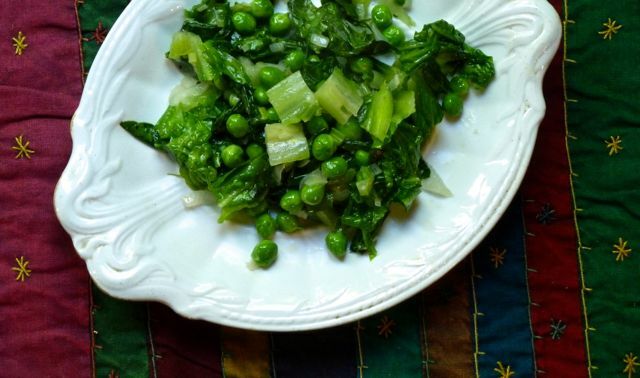 Bok choy, brussel sprouts or broccoli would be perfect alternatives. If you like, make an extra batch of sauce as a marinade for firm tofu cubes. Marinate the tofu for 15 minutes or so, then stir-fry the cubes (discarding the marinade) in hot oil before you cook the vegetables—until they turn golden-brown and slightly crunchy on the outside. 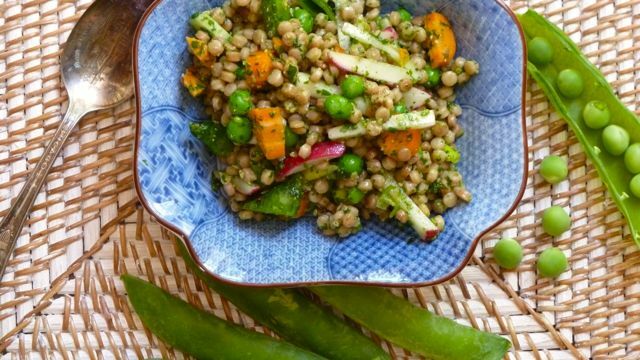 Set the tofu aside while you cook the veggies, then add it back in with the nuts and peas. Serve over rice or cooked spaghetti noodles or by itself as a side dish. 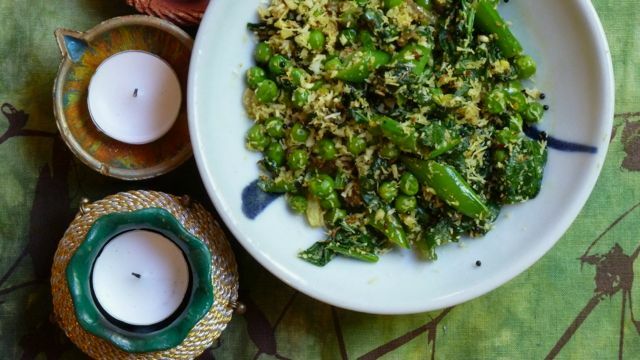 Whole spices and coconut toasted in the pan evoke Indian flavors, though this dish works well with all sorts of menus. Black mustard seeds are a staple of Southern Indian cuisine. They’re stocked at most grocery stores, but head to an Indian market where you’ll find them inexpensively priced, in bulk, along with all sorts of other goodies like lentils and tea.